My yearning to be outside and get dirty makes me impulsive: I can’t possibly plant peas this weekend as I’d hoped. It’s just too muddy, and the poor seeds would rot in the ground before they had a chance to germinate. Peas will tolerate frost and a dusting of snow but want soil that’s moist and workable, not muddy. And I found something ever better! Every winter I get insecure about my ability to grow and buy a few gardening books. They are all excellent with beautiful, color photos, and I think, “I could have written that”. This time I found a book that taught me several successful early planting techniques: pre-sprouting seeds and testing soil warmth with a soil thermometer. The book is Grow Cook Eat: A Food Lover’s Guide to Vegetable Gardening by Willi Galloway (Sasquatch Books, 2012). Pre-sprouting. Galloway recommends pre-spouting peas indoors before planting, not just soaking them overnight as is common practice. When pre-sprouted, the sown pea seed already has a root that absorbs excess moisture in the soil so the seed doesn’t rot. Pre-sprouting solves another problem I’ve often puzzled over this time of year. The seeds need warmth to germinate in the soil but as soon as they sprout above ground, they want it cool to flourish and flower. Pre-sprouting peas indoors solves this soil warmth versus air temperature/germination versus sprouting above ground problem. 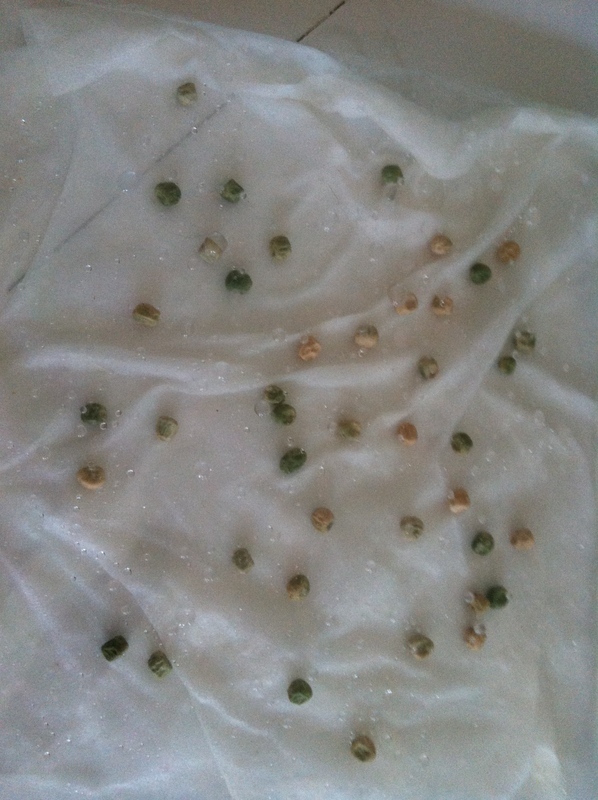 To pre-sprout peas, place pea seeds on a wet, double paper towel. Peas should be arranged in a single layer and securely covered with another wet, double paper towel. Put the sandwiched peas carefully into a large, zip lock bag and zip three-quarters shut. Place in a warm spot such as your kitchen counter. 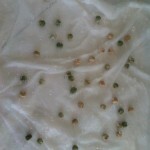 Check the pea seeds daily and make sure to keep the paper towels consistently wet but not soggy. After 3-4 days, little roots will emerge from the seeds. Sow them one inch deep, root down, very carefully so the roots don’t snap off . * Galloway states that pre-sprouted peas beat the overnight soaked peas by a week once planted. Soil warmth testing: Galloway also suggests one invest in a soil thermometer and use it to determine when to plant rather than relying on calculations of first and last frost dates and hardiness zones. Using a soil thermometer takes all the guess work and worry out of early spring planting. This makes good sense of experience too: it’s the soil temperature that initially drives plant growth, not air temperature and lengthening daylight. Let me know what you think and what works for you when early planting. I’ll let you know how I fare. * As you may recall, I plant my peas close together, about one inch apart, so I can thin them and eat the early, tender sprouts. They are delicious and sweet in salads. And Galloway endorses this close planting for the same reason. This entry was posted in planting, seed starting, snap & snow peas. Bookmark the permalink.